“I gained weight!” If you have felt the panic of a rising scale, this post is for you. Learn 3 steps to help you move forward to better health today. Have you ever eaten differently when you’re out in public or around friends and family than when you were by yourself? Have you ever walked through the grocery store with a cart full of “healthy” foods boastful of your choices but then snuck into a fast food joint on your way home to buy something unhealthy? And, as a person who values honesty and integrity above all else– it’s awful. Heart-wrenching. Deflating. My heart sank every time I hid a granola bar wrapper underneath other trash so I wouldn’t be found out. My stomach dropped when someone walked around the corner when I was eating something I thought I shouldn’t be. My contrasting food personas and constantly feeling like I messed up my diet were wearing me out. It had to stop. And, that’s why I am so transparent about those past struggles. Sin and sadness fester in the darkness. My goal is to shine a light both in your heart and in mine. This, my friend, is an exposé of sorts. I’m sharing this post to get my story out there so that 1) I don’t feel like I’m hiding 2) Because I believe it will help others 3) To further convince myself that I actually believe it’s true. I decided to put my health first and– I gained weight. But, more about that later. WHAT DOES SOCIETY SAY ABOUT GAINING WEIGHT? Thin is in and fat is out. We now tie a massive amount of our personal value to where we fall on that weight continuum. But, what we miss is that these body ideals only exist because someone you don’t know, someone you’ll never have over for dinner or gab with on the phone until midnight, decided that being thin was something worth striving for. Regardless, “they” use this ideal to profit in more ways than you can imagine. I have seen this at work in my own life– angst over a jeans size for no other reason than it wasn’t a number that would sell a weight loss article in a magazine. And… it had to stop. <h2″>WHAT DOES GOD SAY ABOUT GAINING WEIGHT? It was an everyday Friday afternoon and I was humming along doing some laundry when it hit me like a punch in the gut. I had made plans with a friend to meet for coffee and it was well past our meeting time. I looked at my phone only to see 2 missed calls and twice as many text messages. Ugh, I felt sick. Letting a friend or loved one down is an awful feeling. Feeling like you have disappointed your Heavenly Father– that’s painful enough to make a girl put up a big ol’ wall around her heart. But is gaining weight really the letdown to God that we think it is? Does He utter a disappointed sigh each time the scale reads a little more than it did last time? Are you destined to stop binge eating on your own? God doesn’t look at your body shape and size. He doesn’t measure your worth by your gravitational pull on the earth. He looks at your heart. The innermost part of your thoughts, feelings, motives. What is your weight gain (or loss or maintenance) a product of? 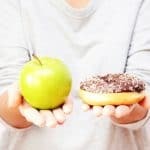 Are there areas of your life that could be better aligned with His will that would result in shedding unhealthy weight? Or is your body simply settling at a number that is higher than a worldly ideal? When I embraced God’s assessment of what’s important and what’s not, I was able to see that my weight was an inaccurate measurement of the state of my heart. At my thinnest, I binged and stressed over every centimeter of my thigh circumference. I believe this was displeasing to God. Now heavier, my primary focus is the state of my heart and the stewardship of my body. And, I believe this pleases Him. WHAT DO YOU SAY ABOUT GAINING WEIGHT? Of all the “critics” above and below, you are the toughest one to please. Like opposing candidates who bash one another, you have launched an attack on yourself. If you’re overwhelmed, confused or feeling depressed about weight gain– it’s time to examine how your thoughts, feelings, and reactions impact your outcome and your overall quality of life. DO YOU EVER FEEL JUDGED BECAUSE OF YOUR WEIGHT GAIN? He didn’t mean to be rude, but now you’re biting your tongue and planning your attack. Rather than responding to your husband’s comment about how much food you ate at dinner– you’re keeping your cool and boiling at the same time. While you could strangle him, you decide to suffocate yourself in a bag of sweet, neon-colored cereal instead. Now, imagine that you are living with that inner dinner critic all the time. He’s telling you how you should never have eaten that mini-muffin at your Bible study. He’s constantly pointing out how you’re lacking in self-control lately. Then, he’s whispering in your ear that it’s kinda gross the way your belly hangs over your pants. Yikes, do you feel like you want to drown in a pool of chocolate pudding yet? This, my friend, is exactly what we do to ourselves when we offer a constant stream of personal beratements about how we eat and look. Maybe you’ve gained a lot of weight in a short period of time. Or, it feels like you’re gaining weight for no reason. You don’t know what to do and you go on the offense– you try to shame yourself into shape. But… it backfires. Every. Single. Time. You feel so bad about yourself and your expanding waistline that you continue to eat for comfort. It’s an awful cycle that you see happening, but you don’t know how to make it stop. Over the years God has stretched me in ways I’m glad I didn’t see coming. As a teenager, young adult, and early 30’s gal, I was obsessed with the size and shape of my body. I vacillated from periods of pride to seasons of shame. My weight was my identity. God saw this. And, in His grace and love (and awareness of what will actually matter in eternity), He sought to do something about it. He has held great things at arm’s length, so that idol needed to crumble. In 2014, I gained 15+ pounds as a last ditch effort to get pregnant. This sacrifice of self was worth every inch to pinch. We now have an incredible little girl who makes our lives truly magical. But, God wasn’t done yet. He had more for me, my family, and my ministry. And that more meant “more” pounds. You see, ever since I went on my first diet at age 14, I have dealt with negative dieting consequences. Consequences that I glazed over as no big deal. But, as you may know– parenthood and age have a way of shifting our priorities. Suddenly my struggling thyroid, wacky hormones, jacked up digestion, and wicked brain fog that feels like cotton in my head were important. And, I decided to do something about it. I sought out what I believed to be qualified medical help. I was told that my years of chronic dieting and constant pursuit of eating less caught up to me. After 2 months of eating lots of whole, nourishing foods, I gained 15 pounds. I admit that writing this makes my insides feel like a deflated balloon that lingers after a birthday party. I’d determined what really matters when it comes to my size and weight, and it didn’t turn out as I’d hoped. I do feel a little better. My brain fog has improved some but my thyroid numbers tanked. It’s disappointing– but I know God is in control. So, now I’ve switched practitioners and I’m hoping to find a solution that heals my body and allows it to find its “happy weight.” But, praise God, this extra fluff has not stolen my joy. That is growth! Maybe you’ve gained weight and it was not your plan. Maybe you can track every error along the way. You’re frustrated and you don’t know what to do next. I believe the best thing you can do to find health and happiness is to be gracious with yourself. As we discussed above, what the world thinks is not what God thinks. Your value will never be found in a dress size but in the way your every inch was hand-crafted by the Creator of the Universe. A few pounds do not detract from how smart, funny, and downright incredible you truly are. You have giftings that no amount of weight can bury, and it’s when you embrace these facts that you can stop eating like someone who wants to punish themselves for gaining weight too fast. Here are 3 steps you can take, starting today, to walk in grace and self-kindness so that you can stop overeating to escape your negativity and/or embrace this season of health that God has brought you into (like He has me). 1. Determine who and what matter to you. Pay attention to the “do anything to be skinny” messaging in the world around us. Notice who is promoting these made-up ideals and who is profiting from them. Then, determine who and what you are going to allow to speak to your self-perception and self-worth. Make a conscious decision to rid yourself of these unhelpful messages– unsubscribing from emails, unfollowing on social media, and canceling subscriptions. 2. Celebrate what you have. It pains me to think of how ungrateful I have been for my body and health. While we each have our own challenges, there are enough body blessings to fill up page upon page of gratitude. Hey, that’s a great idea! Set a time for 15 minutes and braindump all of the incredible ways you can appreciate your body and how it allows you to experience your life. From the 5 senses that allow you to see your loved ones and feel their touch and the feet that take you all the places you want to go. List all the ways your body has been great to you. When you can’t look in the mirror without thinking “I gained weight,” it’s hard to dismiss the desperate attempts to “fix” it. However, my best guess is that dieting and food restrictions may have played a role in your current state of frustration. What you need is not another diet but a thoughtful self-care which may include more nutritious food and feel-good movement. Take a step back and examine your relationship with food and your body. What is it you really need? If you struggle with under or overeating, what needs are you attempting to meet by controlling your food intake? Are you reacting to uncomfortable emotions or looking for an excuse to relax after a demanding day? Then, instead of fighting the food, look for simple and appealing ways to meet the true need. 4. Download your printable worksheet. Do you sense that God is calling you to align your goals and values with His? Are you ready to get your eyes off your weight gain and focus on Him? If so, this free Overcoming Weight Loss Idols PDF is the tool you need to get started. Simply input your email address below and subscribe to Grace Filled Plate. I’ll send it to you right away. Weight gain can be about so much more than a higher number on the scale. Those escalating numbers can rock our very core because we’ve allowed our weight to be tightly bound to our value. When weight gain correlates with worth, every pound can be painful. But when we separate ourselves from the world, tune into what God says, and prioritize what we care about– we can break those ties and learn how to be okay with gaining weight. But nothing, absolutely nothing, can change the love that God has for me. Not 5 pounds, not 50, not 5 thousand. You are precious in God’s sight. He loves you too much to leave you attached to something as fleeting as your earthly body. There is more for you. Whether you need to lose or gain weight, you are right where He wants you today. No more shame, no more fear, no more hidden wrappers in the trash can.